How’s 2014 treating you so far? Good I hope..
Well my teenage daughter is now a vegetarian..
My husband some how ended up on a diet and my little guy will only eat applesauce and bacon. So I’ve been inhaling quite a bit of Gin, red wine and ice cream to cope with all the request. I don’t know how to accommodate these people.. In one corner, I have my vegetarian. A vegetarian who if I can recall correctly, the only vegetable they eat is broccoli. Boy, she’s gonna have trouble. Then my husband wants to cut back on the sugar and breads. He informs me of this while holding a half eaten sprinkle sugar cookie in his hand. He's gonna have some trouble also. Resolutions aren’t my thing. I’m not into fad diets and beginning of the year cleanses that have me spending my day in the bathroom. This year I said… will be the year I break down and get the glasses that I so desperately need. This is not a resolution, it's a serious intention. Cause squinting ain’t cute.. neither is holding the paper out 5 inches away from your face to read it. You know what else isn’t cute?… Me wearing glasses. But I can't see, so things are gettin a little shakey and that's not a good look.. for reals. The last time I wore glasses, I ran into an old friend. An old friend who told me just how much I resemble my mother in said glasses. My mom didn’t start wearing glasses until she got older. So did they mean I look like the older or younger version of her? This question revolved in my head for about a week until I couldn’t take it anymore and stop wearing the glasses. But as I narrow my eyes and slightly tilt my head to the side to type this post, its more apparent.. So on the 2nd day of 2014, after feeding my son his applesauce and a few slices of bacon, making my daughter a broccoli and egg omelet and my husband some granola and scrambled egg whites.. I made myself a huge stack of these pancakes..
Then topped them with a sh!t load of butter, drowned them in syrup, sat down and made myself an appointment with the eye doctor. Then I made myself a cocktail. In a large mixing bowl, combine the flour, cornmeal, baking soda, salt, sugar and rosemary. Make a well in the center and pour in eggs, buttermilk and butter. Mix until just combined. 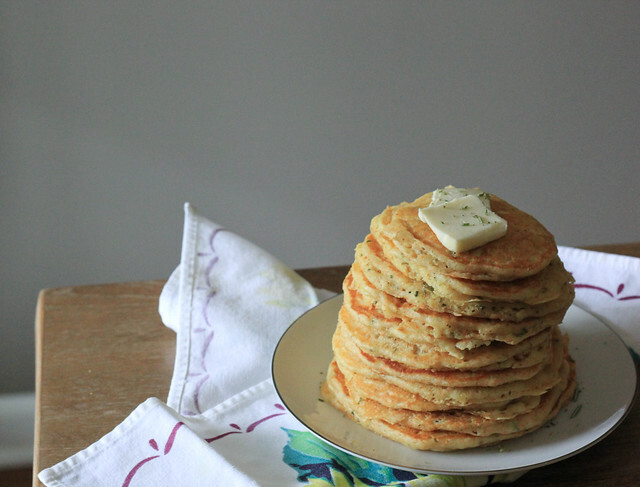 Using a heavy skillet or griddle, melt 2 tablespoons of butter on medium high heat..
Pour about ¼ cup of batter for each pancake onto the griddle (or skillet). When bubbles start to form on the tops and around the edges. 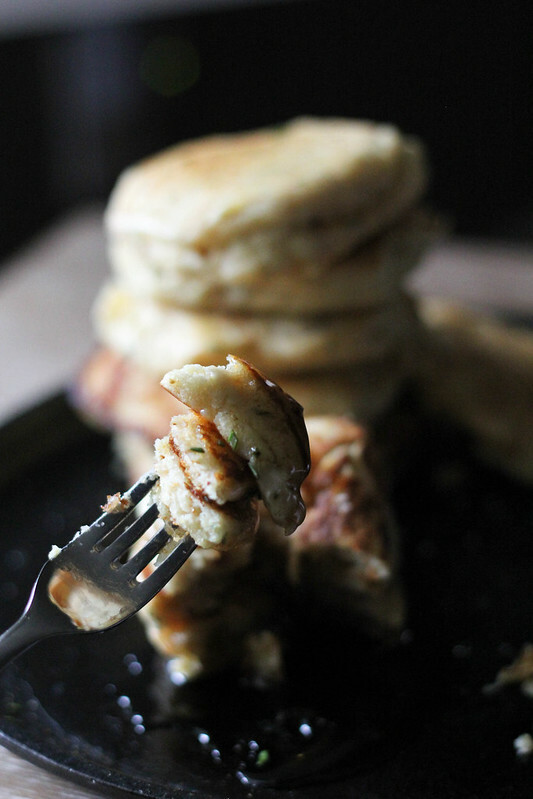 Flip the pancakes over using a spatula to cook the other side until golden brown. This took about 2-3 minutes. Will vary depending on your stove. 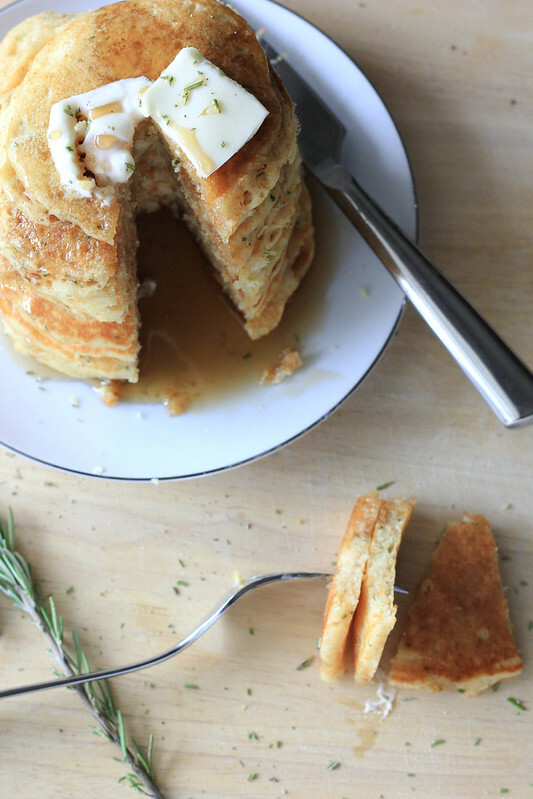 Serve pancakes while warm, with streams of syrup and mountains of butter..